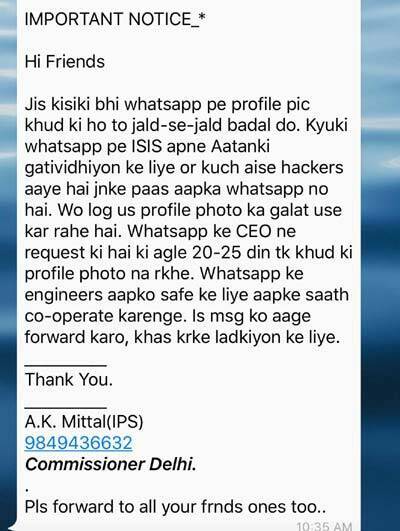 A message on WhatsApp, which claims to be from the Delhi Commissioner and asks users to remove their WhatsApp profile pictures. A WhatsApp message doing the rounds is asking users to remove their profile picture. It is a hoax. First it was the Facebook ‘privacy notice’ hoax, which many users shared thinking it would protect their data, and now it is a WhatsApp message that appears to be going viral. Users might have noticed a new message getting shared extensively on WhatsApp, which claims to be from the Delhi Commissioner, and asks them to remove their WhatsApp profile pictures immediately. And why should you do this? Apparently ISIS plans to rely on some of its hackers to steal these profile pictures, and misuse these for terrorist activities. The message claims WhatsApp’s CEO has also appealed to all users to remove the picture within the next 20-25 days, and users should forward the message to all, especially to girls. In the end, the message is signed off by an A.K. Mittal, who claims to be an IPS, has given out a mobile number (9849436632 ) and claims to be Commissioner Delhi. According to Truecaller, the number is listed as belonging to an Arshad Ali, and has been reported as spam. IMPORTANT NOTICE_* Hi Friends Jis kisiki bhi whatsapp pe profile pic khud ki ho to jald-se-jald badal do. Kyuki whatsapp pe ISIS apne Aatanki gatividhiyon ke liye or kuch aise hackers aaye hai jnke paas aapka whatsapp no hai. Wo log us profile photo ka galat use kar rahe hai. Whatsapp ke CEO ne request ki hai ki agle 20-25 din tk khud ki profile photo na rkhe. Whatsapp ke engineers aapko safe ke liye aapke saath co-operate karenge. Is msg ko aage forward karo, khas krke ladkiyon ke liye. _____________ Thank You. _____________ A.K. Mittal(IPS) 9849436632 *_Commissioner Delhi._* . Pls forward to all your frnds ones too..
WhatsApp forward messages are the most annoying things as some of us who are part of regular family groups might know. Messages with ludicrous claims surrounding health, safety, etc are shared quite often on the app, especially in India where WhatsApp is a favourite. But the truth is most of these are hoax messages and forwarding them is the same as those stupid chain emails that people hated. In short, if you get this message, tell your friends in the group: It’s a fraud.